Now, the father of two daughters, ages 9 and 11, said doctors have given him a life expectancy of at least a year. Stayskal began experiencing extreme breathing problems in January 2017, the report said. “While I was sleeping I felt like I was drowning,” he told Fox 46. Alarmed by his condition, he checked himself into the hospital at Fort Bragg, North Carolina, where doctors took a CT scan and casually sent him home. Instead, his condition rapidly deteriorated, and by May 2017, a barely-conscious Stayskal had to be rushed by his wife, Megan, to Womack Army Medical Center on post. Records from that emergency visit to the hospital reportedly show that doctors re-evaluated Stayskal’s January CT scan and noticed an irregularity that needed to be addressed, calling what they saw a “possible mediastinal mass” and recommending a “transbronchial biopsy,” the investigation said. Inexplicably, Stayskal and his wife were reportedly relayed none of this critical information, and were instead sent home after being told it was simply a case of pneumonia. “They checked my heart and said everything was fine,” Stayskal said. Once again, the reported diagnosis of “fine” proved to be a heinous miscarriage of medical care. Stayskal began coughing up blood soon after being diagnosed with pneumonia. Observing his worsening symptoms, he called an on-post pulmonologist, but as a new patient, was reportedly told he would have to wait at least a month just for an appointment. After the terminal cancer diagnosis one month later, Stayskal made contact with attorney Natalie Khawam of the Whistleblower Law Firm, who agreed to represent the special operations soldier and pursue a “$10 million lawsuit against the government alleging medical malpractice,” the Fox 46 report said. Leskosky, who was hired by the Whistleblower Law Firm to review the CT scans performed by the Army, was astonished that Army doctors missed blatant indicators, allowing the tumor to spread aggressively without treatment. Despite the egregious nature of alleged malpractice, Stayskal’s case is unlikely to ever go to trial. The 1950 Supreme Court decision known as the “Feres Doctrine” prevents active duty military personnel from suing the government for injuries sustained as a result of military service. Conversely, civilians are well within their rights to sue for cases of medical malpractice. Many, however, argue that the government’s application of the Feres Doctrine, a move primarily designed to prevent personnel from suing for war-related injuries, is excessively broad. North Carolina Rep. Richard Hudson, R-Concord, is among those who think the Feres Doctrine is unfairly applied. 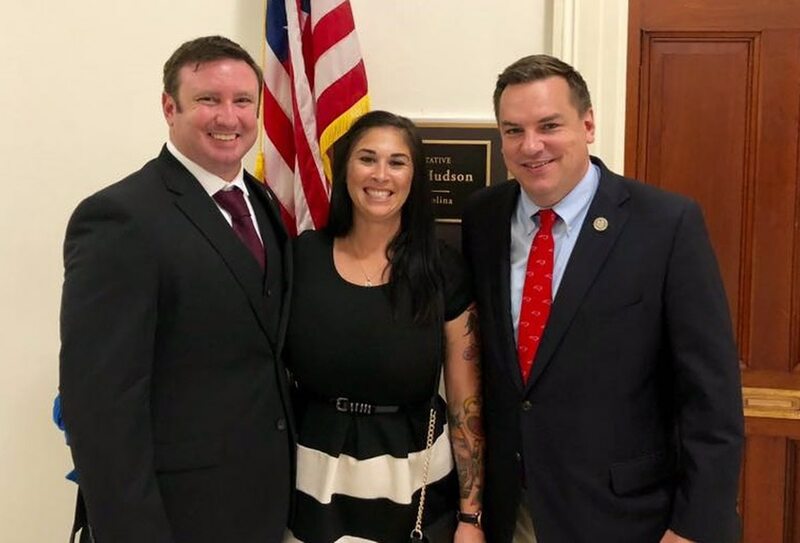 After hearing Stayskal’s story, Hudson drafted legislation with the intent to change the parameters of the Feres Doctrine to allow service members the right to sue the government under specific circumstances. When reached, Department of Defense officials would not comment on Stayskal’s case. “Reversal of the Feres Doctrine would destroy the premise of the no-fault compensation system currently applicable to all workers' compensation programs, including military compensation programs,” Pentagon spokesperson Maj. Carla Gleason told Fox 46. Khawam, meanwhile, insists the case for Stayskal, who nearly gave up his life for his country without objection, has nothing to do with workers' comp, a sentiment echoed by Hudson. “It violates a sense of right and wrong,” he said. Amid the whirlwind of legal procedures and medical treatment plans, Stayskal remains steadfast in trying to be the best husband and father he can be — for as long as he can. While trying to prepare his wife and children for a future that doesn’t include him, Stayskal simultaneously goes about his days trying to maintain a positive outlook, often ignoring that the cancer even exists. No matter how thorough the convincing, however, questions of one’s own mortality are bound to creep in, a factor the Purple Heart recipient who cheated death in Ramadi those many years ago confronts often. “Sometimes you just stare at the things you never stared at before,” he said. “Wondering how many more times you’ll get to see them.